★IMPORTANT NOTICE: This iphone 7 (4.7in.) battery case is NOT compatible with iphone lighting headphone or traditional 3.5mm lighting headphones to listen to music. ONLY works with Apple Airpods or other wireless Bluetooth headphone. 1. Slide the phone into the battery case. Make sure that the phone is well connected to the battery case’s USB connecter. 2. Long press the power button 3 seconds untill led lights on to power on and start charging. To stop charging,just long press power button 3 seconds again till the led light off. 3. 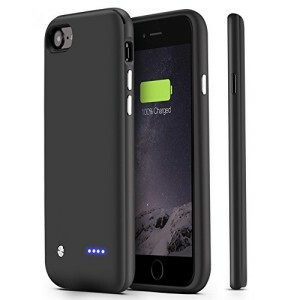 When you connect usb cable to the battery case with phone installed,your phone will be charged first,after phone full charged,it will charge battery case. 4. Please use the original charger that comes with the phone to charge the battery case. Generic or non-original chargers may cause the battery case to malfunction. 5. Please turn off the battery case while not using it.★IMPORTANT NOTICE: It’s NOT compatible with iphone lighting headphone or traditional 3.5mm headphone to listen to music. ONLY compatible with Apple Airpod or other wireless bluetooth headphones. 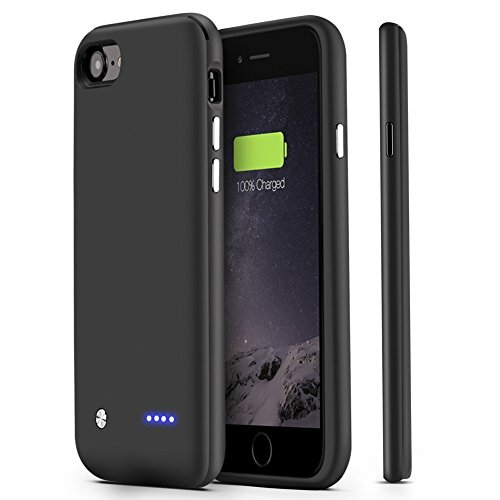 [HIGH CAPACITY&LONG LIFE]: Built-in 3000mAh genuine High Quality Lithium polymer rechargeable battery ,U-good iPhone 7 battery case can provide 120% more extra power to your iPhone 7(4.7′).Equipped with LED indicator lights on the back to check charging status and how much power left.